It’s not a beer fest. Although, it wouldn’t have hurt to have had a few brewskies on hand! Back in March I took the opportunity to participate in the Florida Soaring Society’s opener. The event was hosted by the Orlando Buzzards at their field in Christmas, Florida. For the new year I bought myself two new models. I had been saving up for their purchase for most of 2014. One of them was a very nice Gracia Maxi 3.5e from TopModelCZ. I ordered it from Esprit Model located on the Florida Spacecoast. I cannot recommend the model, the manufacturer, or the supplier with enough enthusiasm. The Gracia is very nicely made. If you’re in the market for a good mid-ranged thermal glider please look at TopModelCZ. The overall fit and finish of the model was the best I’ve ever seen. Ordering from Esprit was an absolute pleasure as well. I had the pleasure of meeting a couple of the employees at a San Felasco DLG event and cannot be happier with their professional level of help. If you ever have a question about your kit or a part these guys will go out of their way to make sure your questions are answered and you are happy with your purchase! I’m going to keep the build of my Gracia for another thread so I’ll get straight to my experience during my first ALES competition. The only other RC competition I’ve been to was a month earlier at San Felasco. It was a discus launch glider event. If you read my article about DLGs then you’ll understand that I was a bit apprehensive of competing. On the day of the competition my dad and I got to the Buzzard’s field located off of Highway 50 in Christmas, FL. According to the weather reports we knew it was going to be a windy day. Getting out of the car made me think that the day was going to be the absolute opposite. It was dead calm, but a bit colder than my Florida blood likes to tolerate. My fears about the wind were immediately replaced by my doubts of being a pilot at his first event when I saw the other competitors and their planes. When we parked and got out of the car I did a walk around to see if I recognized anyone and to see what the planes the other guys were going to fly. Immediately I saw that my Gracia was not going to be one of the top ships in the sky. The most common plane that all but a handful of guys were flying was the Xplorer2. The Xplorer2 is a fully carbon composite plane that looks like someone took a DLG and scaled it up to a 3.8m monster. My attention quickly turned to a part of the field where I saw a gentleman named Jeff hand throwing his Xplorer. I’d met Jeff previously at San Felasco and knew he was a very good pilot. Watching him hand toss his plane, come around for a landing approach, and hit the same spot on multiple flights immediately made me want to get in the car and leave. After seeing the very expensive planes and this amazing pilot I felt very out of my element. It was about the same time that I saw a truck pull in towing a trailer. The trailer had Graves RC’s logo emblazoned on the sign. “This is the last straw,” I thought. I knew at that point Dillon Graves, a participant on the USA Juniors F3K Worlds team, was going to be competing as well. I told my dad that I was feeling out of my element and thought we should leave. We walked back to the van which now had cars parked on either side with pilots getting their planes ready. I just happened to talk to one pilot putting together his nice looking red Xplorer. I told him that it would be my first competition and that I felt that I had no reason to be there. He disagreed and told me to sign up. Someone else overheard and also suggested to go ahead and give it a shot since I was already there. In the end I did! It turns out that since this was my first ever event I fell into the novice class. While I’m not so sure on what classifies me a novice vs. the next class up, expert, I highly doubt that I would ever consider myself a competitor against anyone else at the field. I unpacked my plane, set it up, and prepared a special piece of electronics which is required for ALES pilots. The event turned out to be a mixed winch launch and ALES event. How Does An Event Playout? Most of the pilots at the event used a high powered winch to pull a line that in turn yanked their plane up to about 200m. 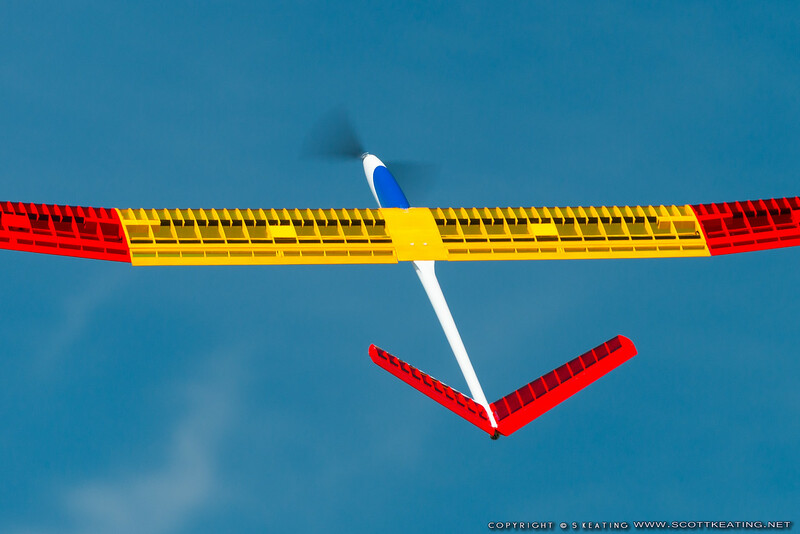 ALES planes use their electric motors to fly to altitude. In order to make all the pilots honest a device that measures time and altitude is installed in an ALES plane. When launched the plane has 30 seconds to make it to the specified altitude, typically 150m, but up to 200m and as low as 100m. If the plane gets to the cut-off altitude before the 30 seconds the device will cut the motor off. This means as a pilot you have 30 seconds to get to the altitude before you have to rely on soaring alone to meet your target time. It is then the goal to use the full 30 seconds to get to the altitude so that you can count that time underpower towards your total instead of relying on soaring alone to keep you aloft. ALES events have rounds that all pilots fly in. For the event there were to be 7 total. Each round is started by the contest director blowing a horn. During this event it was pretty low-key and there was no set time to complete the round. Some contestants could sandbag and not fly right away and wait for lift to appear before going up. Since no one was doing that and this was a pretty friendly competition that was not a concern. Each round ended after all pilots had entered a time for the round. The goal during a round is to meet a target soaring time. Each round can have different times. During this competition all but the first were 8 mintues. That means that the goal was to keep your glider in the air for exactly 8 minutes and to not go over or under. Going under results in not getting a full score while going over gets penalty points. At the end of the goal time a spot landing is performed. 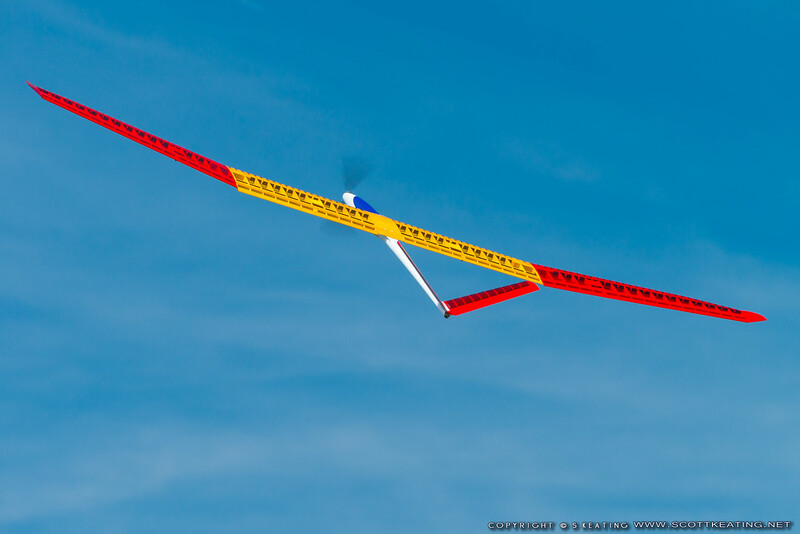 As you approach your goal time the glider is flown into a pattern so that right as you’re about to hit the time the pilot lands their plane as close as possible to a marker. Landing directly on the marker, meaning that’s where the nose of the plane hits, gets you full points. Points are deducted the further you land from the marker. Well the first round I was really nervous. Luckily I had the help of two seasoned and very friendly pilots. One of them held and launched my plane (so I could focus on the transmitter) while the other did my timing. After my launch they both did a great job of helping me find lift. I don’t remember what my time was but it wasn’t much more than halfway through the 7 minutes that I needed for the round. I unfortunately didn’t make it near enough to the spot to get any landing points. My next two rounds showed a little progress but still not anywhere nearing the goal times of the rounds. I did, however, get landing points on the third flight which did make me happy. Getting some help putting the Gracia in the air. The wind that wasn’t at the field when we unloaded quickly came up during the early rounds. By the time the last round before lunch came up it was pretty windy. 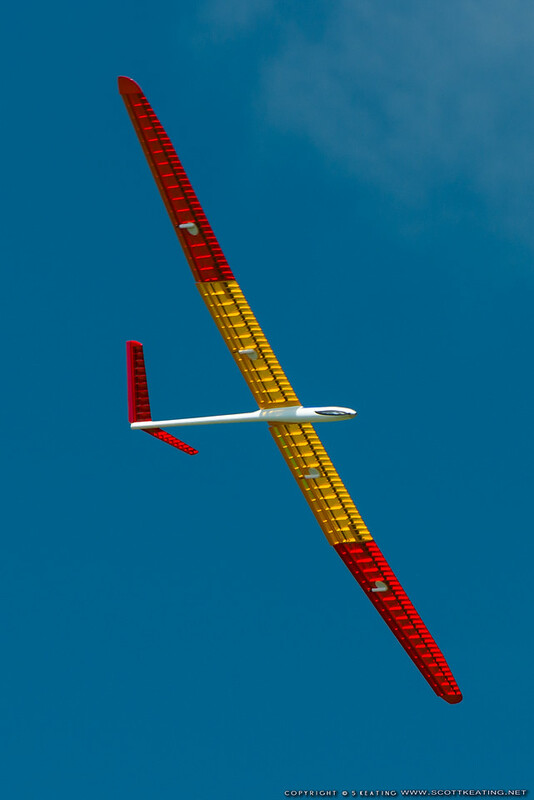 Now the Gracia has a thick wing made from balsa and reinforced with carbon. It is very, very different than the razor-like wings on the Xplorers. 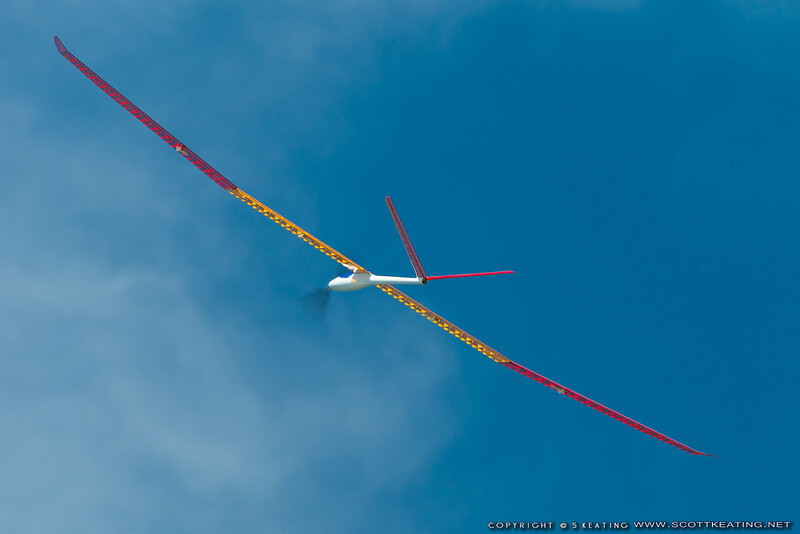 When the wind picks up with a pilot with a plane like an Xplorer can add ballast to help it penetrate through the air. Since the goal is to soar with the thermals a glider will typically start upwind and then follow the thermals as they move downwind. To land the pilot must be sure that he is capable of getting the plane to penetrate through the wind and get back to the landing site. The top pilots would be more than a 1/2 downwind and still find a way to get back. The Gracia just was not capable of doing this feat. I was lucky to make it a couple hundred yards going into the wind. The wind did help me on the round before lunch. I launched and went as far upwind as I could. I got to the eastern side of the field which had a treeline. I think another field on the other side of it allowed the wind to push up from the trees and give me lift. I was able to sit up in one spot, not going forward or backward. At 7 minutes into my flight I turned the plane and came downwind. However, I went too far and was unable to make it back for a spot landing. I ended up getting my best time of the day, 7:56. After lunch break there were three more rounds. With the wind at 12+ m/2 it was hard for me to do much. Getting back to the treeline proved difficult. I’d often loose altitude and not wanting to try to find a way to fish my plane from the trees would move out of that area and be forced to land much sooner than I would have liked. I think I even had one sub 3 minute round. I had fun though. I’m really glad I stayed and did the event. I learned a ton and I got to hang out with some really nice and helpful people. It turns out that there was a professional photographer that was spectating at the event. All the photos in this post are courtesy of Scott Keating. He was kind enough to share them with the participants. Looking through his album I noticed he was very taken with my plane. Out of the 20 or so participants my plane had the most pictures. I guess there is one advantage to not rocking the same $2500 Xplorer that the other guys have! Tagged ALES, Florida Soaring Society, FSS, Gracia Maxi, Orlando Buzzards, RC, Soaring. Bookmark the permalink.